The question was would we support it, if it was decided by the powers that can make that decision - what ever their rational. Yes I would support it. A camp 1/4 mile away with three barracks style buildings than can house 192 people each. 1000 hotel rooms with 20 miles. Mr. Fishburn stepped up for the Ohio shooters and created the Cardinal Center. By all accounts it's an excellent facility and He spares no expense to improve it. I have no doubt that He would create a first class facility for pistol shooters. I could see many more pistol matches at this facility. Dennis, would it be more convenient for folks to answer if you reposted your question as a "poll"? I personally favor the historical traditions of Camp Perry, but the problem is, Camp Perry as a government installation is not competitor friendly. I have been attending the National matches since 2008, and it appears to me, that all the tear down, and various remodeling have not been at all sensitive to the needs of either the competitors or the National matches. (The RV park is roughly one third the size they could fill at the current price of gas). It has been five years since I have been able to get a place to stay on post (no barracks for women). In my opinion, any decision about moving the national matches would be done on the math. What does the NRA have invested in the facilities on Camp Perry? What would it cost to duplicate those facilities at another location? Are the lease terms that the NRA gets from the state of Ohio for the use of the facility competitive with a private alternative? And if they are not, can they be renegotiated? What kind of money would the NRA be willing to come up with to make the move? Also, what does the CMP think? Would they be willing to move their matches or would that destroy the value of their already extensive operation at Camp Perry? All this information would need to go into a cost benefit analysis, and it is information none of the people on this board are privy to. ShaumannK wrote: All this information would need to go into a cost benefit analysis, and it is information none of the people on this board are privy to. Well said. It would be great if NRA would pull back the curtain and be more open so the competitors can really be aware of the inner workings of their sport. NRA is merely an instrument of it's members--at least is SHOULD be. As I understand, Cardinal is creating this facility in a scale large enough to host the national pistol matches at their own expense! They are fabricating the turning target system to turn cardboard targets. I am told they are building this facility in a manner that will be a better experience for the competitors and vendors in EVERY way, all at Cardinal's expense. The National Pistol Championships should be held at the BEST facility that is capable of handling the matches. If Cardinal ends up being the best facility, then we should reward Cardinal for investing in our sport and move our shooter's dollars there. Money and economics create incentives. The incentive to move the National Pistol Matches to Cardinal would be this: NRA would no longer be forced to rebuild the turning target system at Camp Perry. Other incentives: Ohio National Guard, Port Clinton/Sandusky, CMP would all have a new incentive to win the National Pistol Matches back to Camp Perry. Perhaps that will lead to new investment into pistol matches at Camp Perry--but they will need to raise the bar even higher than Cardinal did to compete. That would be a win-win for us as competitors. If the Cardinal facility gets built to a standard that is higher than the one we have now, by all means--let's try it and see what happens. If the NRA does sign a contract with Cardinal for 2017, you can bet that all of the nostalgics will show up for what might be the last year of the National Pistol Matches at Camp Perry. A spike in the number of participants would be a great boost to prove this sport is still alive and well. If only we could get the NRA to see that it's so. The quick answer YES. I've toured the cardinal center and believe it will be the savior of precision pistol as a sport. They understand how to hold a competition and how to make it profitable for all involved. Sponsors need to be involved and The Cardinal center has that sorted out. Vendors row will be wonderful and the matches held could be not just the nationals but Monthly matches as well. Perry is a once a year pistol event. They have to build, teardown and store all the equipment. It is not designed to host that much foot traffic on the range. Weather conditions can completely destroy the matches. The facilities available are far superior and nearby activities are plentiful. They have their own radio station, Own TV station, WiFi throughout the facility. Live feed scoring. Electronic wailing wall for score and challenge. Electronic check in and match sign up. Not just for us. Their facility will spread through other disciplines. Shot gunners will be intrigued to try our sport as well as other action-pistol or small bore opportunities. I think this will be a big payout for the sport and competitive shooters as a whole. Competition mostly benefits the consumer. This new range would provide competition to Camp Perry as a host for the National championships. We competitors, and the sport, are in a better position because of this. East of Viale range there is a large unused, swampy area that is capable of holding a 1,100 yard long bullseye pistol range with well over 1000 firing points. Imagine a permanent, covered, bullseye pistol range for the National Championships where every competitor shot at once, or at least in relays of 1000. 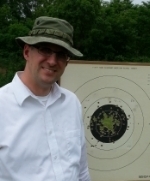 Maybe a little venue competition would provide better incentive for a better pistol range at Camp Perry. It seems to me that the main perry issue is the condition of the target system. That just doesn't seem like an insurmountable issue. Sure so e people complain about housing. But there is ALOT of housing around Perry. I'm lukewarm on covers , especially for iron sights. But covers go up at 600 for rifle. I like the history of port Clinton. How about if we focus on targets and then worry about a new location. Is it likely to close? No. We would be small compared to what they run there. Would we have a better target system? Yes. Would that system be electronic or turning? I don't know. They were leaning toward turning but the owner asked me about electronic and I gave him the run down. He was interested and could change to electronic. Would the NRA save money? Probably, but I don't know what we would be charged for use of the facility yet. We won't get it for free like Camp Perry - and Camp Perry might be charging soon. Will competitors buy into the move? I don't know. With Smallbore on a temporary move I've gotten an earful for 2 years from everyone who thinks that Camp Perry is the only place in the world to shoot. Some do not attend the National Championship because it is not currently being held at Camp Perry. The competitors and staff will need to adapt quickly to everything being new and different. There would be lots of logistics for the NRA to work out but it can be done. However, they are set up for everything, including a medical facility on the property. Internet, phones, stats, registration, and almost everything else would be improved. In my visit there wasn't a question that I asked that they didn't have an answer for. I have suggested that they could run a Regional Championship on the range immediately preceding the Nationals. Although we do enter into contracts with OHNG and CMP, the contracts can be broken upon proper notification. The contracts more or less spell out the duties of each party and are not expensive for any party. Improvements made have NOT been done with the competitor in mind is correct, to a certain point. This is a military facility and any and all improvements made must be for a military purpose. However, if that military purpose can also benefit us, so be it. Hence, the new huts are housing for military units arriving for training. The improved firing lines for long range rifle on Viale are for military marksmanship. Covered firing line at Camp Perry at 600 yards. This is not true. What they have is shelter behind the 600 yard firing line, just like the shelter put up for Pistol. DirComp wrote "I have suggested that they could run a Regional Championship on the range immediately preceding the Nationals." I doubt this would be a success with as big a following as the Canton Regional has, but maybe two weeks before. DirComp wrote: Will competitors buy into the move? It will be much more difficult to obtain buy in if they switch to non-turning electronic targets. I've been reading the new rulebook, and I haven't gotten to the end of it yet, but the 2014 rules still don't address the ground rules for an electronic target match. Dennis is right. Cardinal Center is a place where everything is done with the competitor in mind. That is not the ONG's philosophy nor should it be. As far as smallbore is concerned I don't think that is a valid comparison. It was moved from Perry to Bristol which was a step WAY down. Bristol is a nice range but in no way is it even remotely the type of facility that a National match of any sort should be held. In my opinion that is why so many shooters complained. To those of you who think that a regional could not, should not, or wouldn't be popular there. I've shot at Cardinal before with my son. I know firsthand how beautiful the place is and how comfortable it is for a shooter. If a match were held there and at Canton on the same day, I would have no problem making a decision where I would shoot. I would challenge every shooter traveling to Perry and are coming close to Cardinal Center to stop by there and take a look. Look at the campgrounds, vendors row, the ranges, the drainage. This is a place truly worthy of hosting our most important event. Looks like the Pistol Matches are moving to this new facility in 2017. Did anyone bother to ask the pistol shooters where they want to shoot? I suspect most would want to stay at Camp Perry. Camp Perry is a tradition, I go for the local attractions and restaurants as well as the shooing and camaraderie. Well, tradition aside, If CC does for pistol what they did for trap, it will be a world class facility. james r chapman wrote: Well, tradition aside, If CC does for pistol what they did for trap, it will be a world class facility. +1, I bet next year at Perry will be full! THE NRA DOES NOT HAVE AN AGREEMENT WITH ANYONE TO MOVE THE NATIONAL CHAMPIONSHIPS. BRIAN'S STATEMENT IS FALSE. Thank you for that clarification Dennis. Unfortunately that article has caused quite a stir. I am glad the article caused a stir..it's about time.. Frankly, after this massive crusade to switch to e -targets, I stand firmly with Brian..
All this "Traditional Bluster" and then advocate e- targets.. ?????????????? after this massive crusade to switch to e -targets, I stand firmly with Brian.. I also stand with Cardinal--for investing so much to create a venue for pistol shooting that exceeds all others. If the cost to the competitors end up being similar or less (because Cardinal knows how to secure sponsors, and their costs can be offset by holding more than 1 match/year as a way to spread their costs over a wider group of competitors) then I say it's a no brainer! Remember 3 years ago when NRA said the Camp Perry target systems needed to be replaced immediately? Cardinal is doing that--at their own expense. I say "thank you" Cardinal for investing in our sport when others did not. "Remember 3 years ago when NRA said the Camp Perry target systems needed to be replaced immediately?" There is not an abundance of condo rentals or hotel rooms near the Cardinal shooting complex. Port Clinton is about a 2 hr drive so I won't be using the condo from past years. Not sure I want to stay in the Columbus area due to the crime rate in some parts of the city. Has anyone checked with Cardinal to see what they recommend? At this point I will probably pass on the first year at Cardinal.